The first method is to use the LoadRunner LDAP Protocol. This is preferred as it is native to LoadRunner, meaning less compatibility issues and faster execution times. This method requires a license for the LDAP protocol. The second method is to use Java to generate the calls within a LoadRunner script. This method is slower as it requires a JVM, and the scripts are more complex as you need to define a lot of information about the LDAP connection. This is primarily a backup method for when there is no LDAP protocol license for LoadRunner. The third method is using JMeter. Apache JMeter is a Java desktop application designed to load test functional behaviour and measure performance. The final method is a proposed method via PHP. This method is included for reference only. LDAP provides a lightweight way to access directories of objects stored in a hierarchical tree. Each object in the tree contains attributes describing what it is, and where it is stored in the tree. The attributes for each object is defined in a schema that is inherited from the objects class, and each object may be a member of several object classes and attributes can be mandatory or optional. An example of an LDAP directory is provided below. 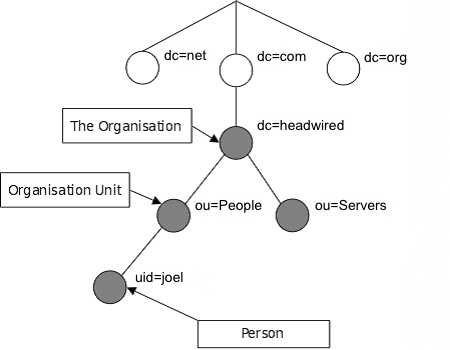 In this example, we have users which are part of the people organizational unit of headwired.com. This schema defines that an entry with the objectclass=person, has Surname (sn) and Common Name (cn) as mandatory fields, and userPassword, telephoneNumber and seeAlso as optional fields. The DN defines the entries location within the LDAP directory. A search base (the distinguished name of the search base object) defines the location in the directory from which the LDAP search begins. A search scope defines how deep to search within the search base. Base, or zero level, indicates a search of the base object only. One level indicates a search of objects immediately subordinate to the base object, but does not include the base object itself. Subtree indicates a search of the base object and the entire subtree of which the base object distinguished name is the topmost object. A filter allows certain entries in the subtree and excludes others. A selection indicates what attributes to return from objects that match the filter criteria. Optional controls affect how the search is processed. 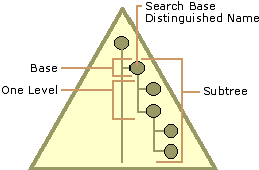 The diagram below shows a visual representation of the search base. This would return our test user. The full attributes for our test user are as follows. Note being a test user, a majority of attributes are left empty. 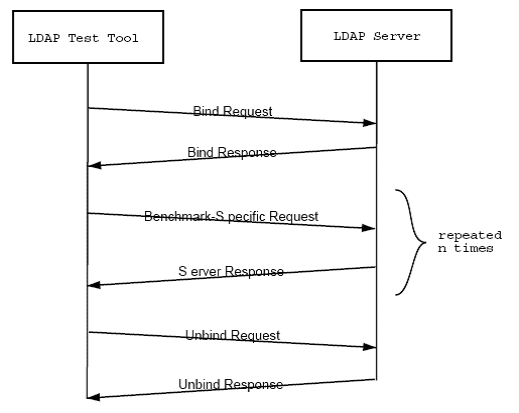 From a performance testing viewpoint, LDAP is a simple response request protocol. In fact, a basic test is very similar an Authenticated HTTP Session. 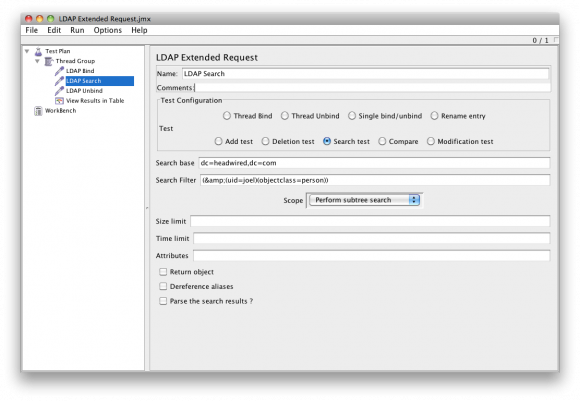 The LDAP Search command executes an LDAP search query against the server once the bind has been successful. The filter will depend on what you are trying to retrieve, in the example below it is looking for a record where the record contains the uid of the person (example: ‘tester’) and the object class is a person. To view the results of the LDAP search, we must loop through the results and get the attribute values. This is useful for debugging only, as this does slow down the Vuser script execution. As the search is Asynchronous, even when we know that there will be only one result, we still need to perform the ‘mldap_get_next_entry’ command. In the case where we are searching for a user, and only expect one result, the following will get the single results attributes. This command will close the users bind with the LDAP server. This will stop errors relating to maxing out the connection pool. Once a connection is closed a new bind must be made with the server to perform LDAP searches. Further information about the “mldap” LoadRunner functions can be found in the HP LoadRunner documentation. Now you have your certificate, you need to create a certificate database. You will need a UNIX box with ‘certutil’ installed. There is a ‘certutil.exe’ on Windows, yet the arguments don’t match up with the UNIX version. The LDAP over SSL functionality in LoadRunner at 9.10 requires that the certificate files be accessable from a file:// url. This means that the files need to be on a local drive. A mapped network drive might be possible, yet as this file will be required for each bind, the latency added by retrieving this file from a network drive could become a factor under load. Now you have your certificate database on your controller, you need to alter the LDAP bind request in your LoadRunner script to add the parameters to use SSL. SSLCertDir has been specified to the directory we just created. The following Java code binds the user (login) to the LDAP server. To view the results of the LDAP search, we must loop through the results and get the attribute values. Once you have the attribute, you can split it out; log it, whatever you want. This is useful for debugging only, as this does slow down the Vuser script execution. Unfortunately, in my short time investigating this method, I did not find a way to get Java to call LDAP unbind. We can however close the context. If you were to use this in a production test, the method to unbind should be investigated. If anyone can suggest the best way to perform an LDAP Unbind in Java, please let me know in the comments. When using Java to connect to LDAP your JDK will already have a certificate database called “cacerts”. This database is located within your JDK under “\jre\lib\security”. You will be prompted for a password. The default password for cacerts is “changeit”. Ensure that you type “yes” to trusting the certificate. We will now change it to look like this. The Context Security Protocol has been defined. These are the only changes required to get LoadRunner to use SSL. Jmeter is a little different to LoadRunner, and the scripts developed are more visual. It is assumed some knowledge of JMeter in this tutorial. The following command binds the user (login) to the LDAP server in JMeter is as follows. 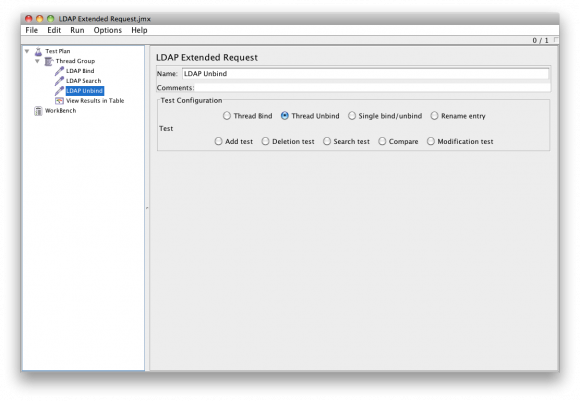 The LDAP Search command executes an LDAP search query against the server once the bind has been successful. The filter will depend on what you are trying to retrieve, in the example below it is looking for a record where the record contains the uid of the person (example: ‘joel’) and the object class is a person. Now you have your certificate database on your controller, you need to alter the LDAP bind request in your JMeter script to add the parameters to use SSL. Note that you must use the JDK that contains the ’cacerts’ certificate database to launch JMeter. Note that this section simply describes the way to get LDAP connections working within PHP for both SSL and non-SSL connections. It is intended that a PHP page that is driven by a load testing tool would act as a bridge to the LDAP server. While the overhead of the HTTP requests between the PHP server and the load generation tool would need to be taken into account, it could potentially provide an alterative for LDAP performance testing. It’s basically a last resort to generating load on an LDAP server. Note that LDAP Bindings CAN NOT be stored in a session variable, meaning that each page must perform all LDAP commands in one page, rather than having bind.php, search.php, etc. This severely limits the usefulness of such a harness. After the connection is made, it is possible to set some options to your LDAP connection, such as changing the protocol version to 3. To view the results of the LDAP search, we must loop through the results and get the attribute values. This is useful for debugging only, as this does slow down script execution. This will create an array of your results for you to sort, and print as you see fit. Further information about the “ldap” PHP functions can be found in the PHP documentation available at . Now we add the trusting part. Oh PHP you naïve little tiger. Now you have your PHP trusting every SSL connection, you need to alter the LDAP connection request in your PHP script to add the parameters to use SSL. These are the only changes required to get PHP to use LDAP over SSL. The bind, search and unbind functions operate in the same method as without SSL. When retrieving LDAP calls from a log, its open written as scope=0 rather than Base as used in LoadRunner. The following is a mapping of the the scopre number to name for LoadRunner.